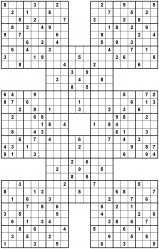 Samurai Sudoku takes the beautifully-constrained logic of a Sudoku puzzle and makes it larger without making it ridiculously complex. 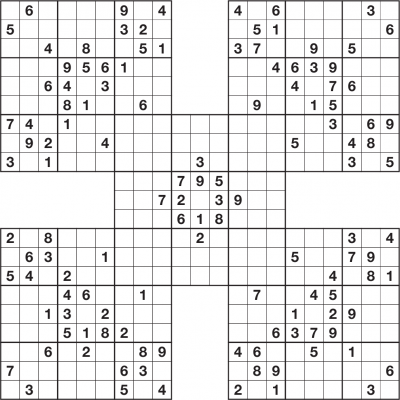 Instead of increasing the number of possible digits in a puzzle, in a Samurai Sudoku an arrangement of multiple grids is overlaid - and then all must be solved simultaneously in order to complete the puzzle. 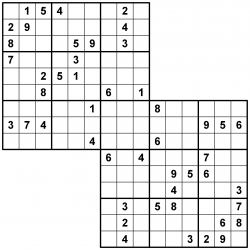 The aim is simple: place the digits 1 to 9 into every row, column and bold-lined 3x3 box of each of the underlying regular 9x9 Sudoku grids. 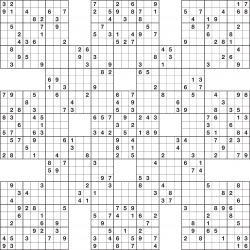 An infinite variety of grid arrangements is possible, and the puzzles need not be 9x9 - take a look at the bar on the right-hand side, and see the Samurai Variety page for some other options. There is only ever one solution, and guessing is never required. 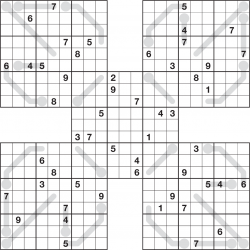 We can supply Samurai Sudoku puzzles (sometimes also known as Gattai or Multi-Grid Sudoku) for any underlying size of grid and with a wide range of variations, such as Sudoku-X regions or Jigsaw pieces - click to view the alternative pages below too.